Maya Speaks at "Designers Without Borders"
Earlier this month, Associate Partner Maya Kopytman participated in the panel discussion, "Designers Without Borders," at the New York Institute of Technology . Along with five other panelists, including Matteo Bologna , Roberto de Vicq , Carole Goodman , Pablo A. Medina , and Takaaki Matsumoto , she discussed how influential cultural backgrounds are in design, particularly in the globalized world we live in today. In her presentation, Maya hopped four continents, discussing the various locations that impacted her youth, education, and profession. 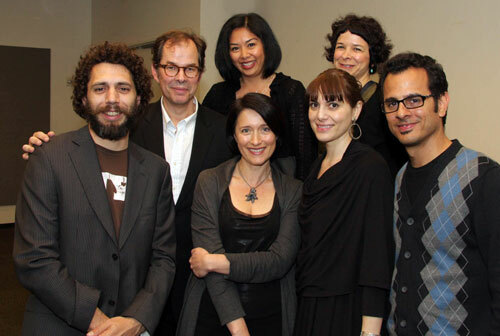 Pictured from left to right: Matteo Bologna, Roberto De Vicq, Patty Wongpakdee, Maya Kopytman, Rozina Vavetsi, Carole Goodman, and Pablo Medina Maya’s early upbringing in Moldova was influenced by the politically-driven design found in the propaganda of the time. With her family’s move to Israel, she was introduced to a new culture with Western design influences, and this combined with her formal graphic design education conducted in Jerusalem, her design philosophy began to take form. In New York City, she honed her skills and pursued further education in interactive design. The combination of these influences eventually culminated in the Caminos del Inka project she led at C&G; Partners, which revolves around the connectivity provided by the Inca Trail throughout South America.